The Forever Manchester abseil saw 43 people abseil 100ft and raise £7k. On a drizzly Mancunian day, our abseilers were attracting quite a lot of attention, and took on the challenge to an impressive standard. We are extremely pleased to say we have gone over our £6,000 fundraising target for this event. We saw Super Mario, Batman and Captain America scale the walls of The Printworks among many other Forever Manchester supporters. Individuals from our corporate supporters; Express Solicitors, Harrington Brooks, Brother, Metronet, Hard Rock Café, MacDonald Hotel, Dinosaur PR, Havas Lynx, Atlantis Digital and JP Hay Lettings took part on the day, raising vital funds for community groups across Greater Manchester. Two of our Ambassadors; Emma Livingstone and Steve Kuncewicz (aka Batman) also braved the 100ft fall. 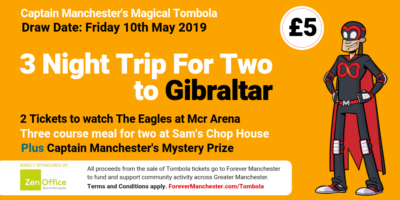 The money raised will go toward improving communities, supporting local people to do extraordinary things and helping grass roots community groups.